Just before Christmas, I headed to Crush Wine and Spirits in midtown — my go-to store for compelling (and fairly priced) wine choices — to stock up for the holidays. It’s a shop run by, and for, wine geeks, with a German Riesling selection second to none. I asked the knowledgeable staff for an inexpensive recommendation from the recently arrived 2010 vintage from Germany. Their suggestion? 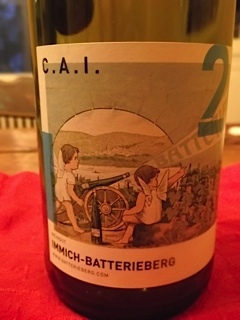 The 2010 Immich-Batterieberg Riesling C.A.I. (Kabinett, Mosel-Saar-Ruwer region), priced at $19.95. On Christmas eve, we decided to have fish — roasted salmon with a spicy rub of orange zest, ground fennel seed, coriander and chipotle. I had selected a lighter Loire red to pair with it, but Kathryn, sneezing violently from an allergic reaction (turns out, she has Christmas Tree Syndrome), couldn’t face the prospect of red wine tannins exacerbating her misery. I offered her a glass of the Immich-Batterieberg Riesling instead, which she tentatively accepted. On first sip, she lit up like the Christmas tree she was now avoiding. “Wow… good,” she said, high praise coming from her. Intrigued, I poured myself a taste. Crackling with energy, intensity and clear citrus fruit, the wine literally exploded across my palate, like a bolt of lightning. Wow, indeed. Pronounced, bell-ringing acidity, for sure, and quite dry (unlike most Mosel Rieslings of Kabinett distinction), but balanced by amazing Meyer lemon, lime zest and grapefruit flavors and a subtle, slatey note. And it more than matched up to the salmon, cutting right through the spicy rub and the rich, meaty fillet, finishing bright, clean and citrusy. This is one white that will improve with some air time, including even decanting. The explosive nature of the C.A.I. bottling dovetails nicely with the “Batterieberg” name, which means “demolition hill” in German. Long owned by the Immich family (1425-1989), the property is comprised of four steep Mosel vineyards around Enkirch, Batterieberg being one, that were all ranked highly in the Prussian Vineyard Classification of 1868 (similar to Bordeaux’s 1855 Classification). Between 1841 and 1845, the story goes, Carl August Immich (honored by the “C.A.I.” on the label) detonated tons of dynamite to form a vineyard on the hill, part of a quartzite-rich slate formation, known thereafter as “Batterieberg”. Fast forward to the present, Immich-Batterieberg has new ownership (since 2009), under the direction of cellar-master Gernot Kollman. Kollman’s preference, and the tradition of the estate’s vineyards, which include a large proportion of old, ungrafted and low-yielding vines on steep slate slopes, is dry Riesling, in a “pure, unadorned and rather powerful style”. The 2010 Riesling C.A.I. certainly reflects this philosophy, despite 2010 having been one of the few difficult vintages in Germany over the last decade. At $20.00, it’s an inexpensive joy-ride for palate thrill-seekers. This entry was posted in Wine, Wine + Food and tagged 2010 Immich-Batterieberg Riesling C.A.I., Crush Wine and Spirits, German Riesling, Gernot Kollman, Immich-Batterieberg, Riesling. Bookmark the permalink.